Once the foundations have been laid, the actual prefab structure is fairly simple to put together. Of course, we need the help of professionals like builders, electricians and plumbers, but the large sections like the window frames and side walls have been transported to the site and are simply read to be slotted into place and fixed with the proper tools and equipment. This can reduce building times dramatically. 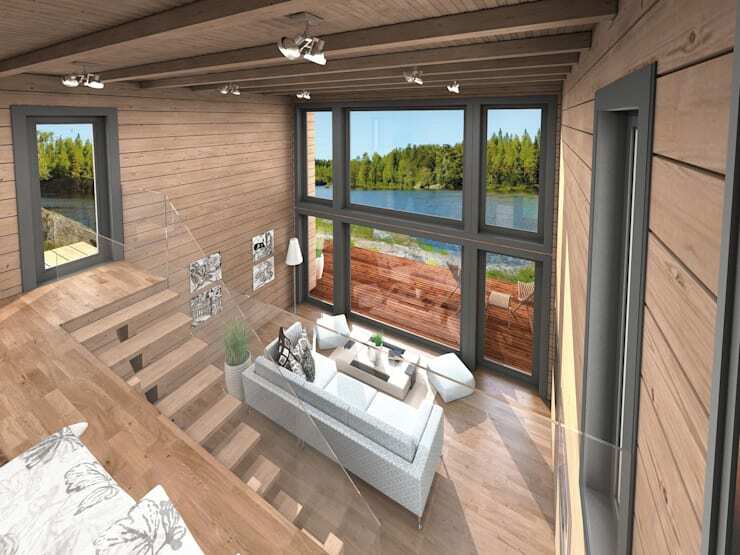 Already we can see this home is going to be unique offering large panoramic views of the surrounding countryside through its large top and bottom floor windows. The walls are composed primarily of wooden sections; there will be no need to lay bricks, thus cutting down overall building time. The team at THULE BLOCKHAUS GMBH obviously decided to get the work done quickly. Their experts are seen here joining the frames of the 2nd floor windows and laying the top floor, working into the night. Notice the main structure is in place and the back doors installed. It's difficult to see where and how stairs will be incorporated in the design but rest assured this skeleton construction will soon be an ultra-modern home with all the trims! Any architects out there? 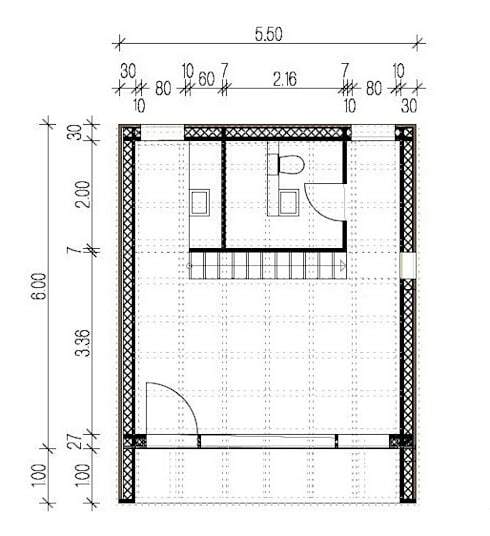 If so, you may wish to analyze these floor plans. Now we can see where the stairs fit in and the top floor and the bathroom exist! 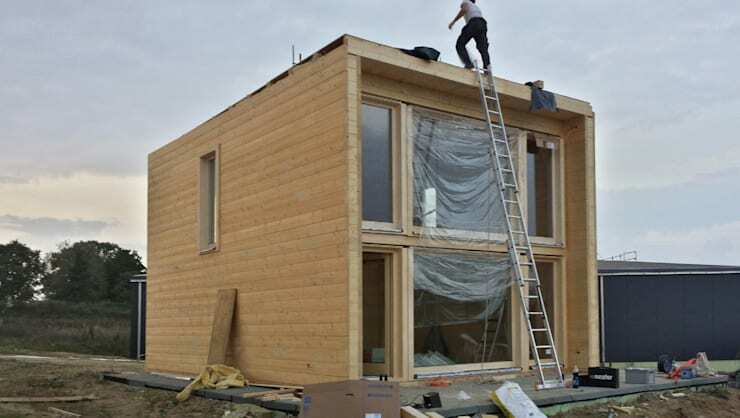 Yes, prefab homes, just like bricks and mortar homes (or even lego homes) need some plans for the builders to lay down component parts. 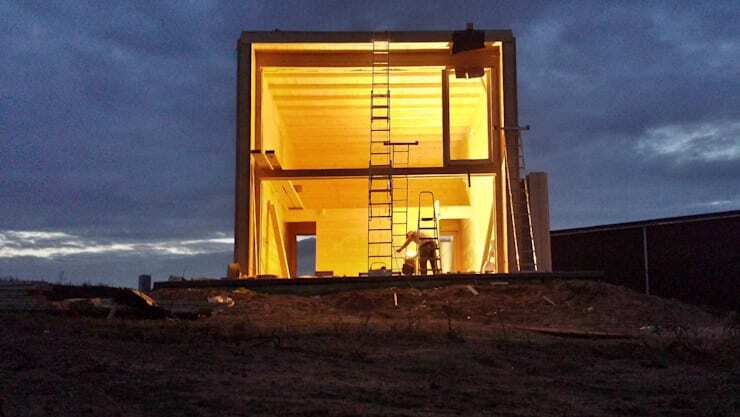 This computer-generated image shows just how this prefabricated house will look once completed. The impressive floor to ceiling windows are separated by stylish, cross-section, grey beams complimented beautifully by the extensive use of pale wood. Lighting is thoroughly modern in silver ceiling lamps. The spectacular high ceiling creates an amazing sense of space and allows a massive amount of light to penetrate into every corner. When we talk about the style, we can say that simplicity is bliss. Minimalist and clear. This is a room free of clutter. The living room view (and the countryside environment) is what counts. A perfect location for time out of the city. Set on a raised decking with a beautiful area to unwind on a deck chair amid nature and the sounds of birds, water and the wind slipping through the spaces between leaves and branches… Tranquility. Everything you need is here. Whether inside or outside, the view is almost the same. Observe the outside slatted stairway with glass security. The colour choice of the exterior wood is in keeping with the colour of the trees. The long side wall windows permit even more light into the interior. 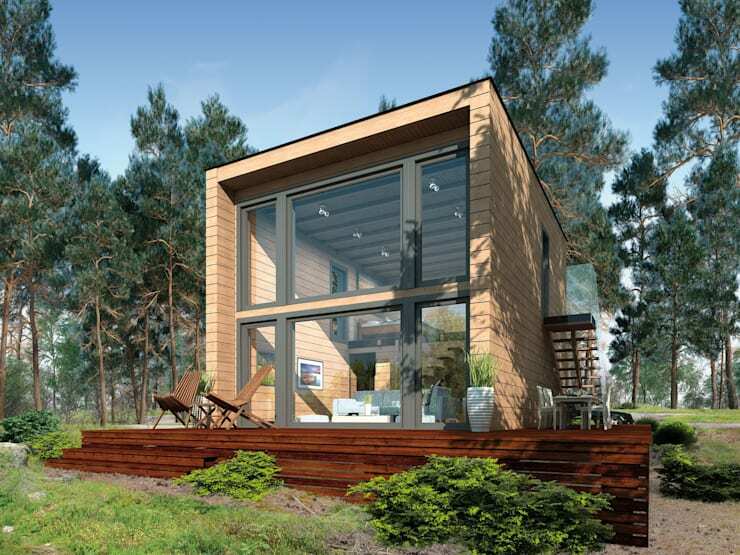 Has this home inspired you to build your own prefab?